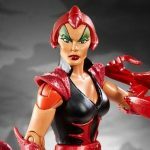 MattyCollector has set a re-release of their Masters of the Universe Classics Scorpia figure. We first saw Scorpia nearly three years ago. Now, fans will be able to grab the figure again this month if they missed out on the last release. Lynda D’Ream is a nightmare for the people of Brightmoon. The wicked warrior has all of Etheria tightly in her claw-like grasp, and she’s not letting go anytime soon. This first-time, fan-demanded Scorpia figure arrives in Filmation-style, with a fully articulated tail and her Horde crossbow with scorpion design. This month, you can add our Scorpia figure to your collection during our early-access & all-access sales! Early-access sales starts Thursday, May 12th from 8AM Pacific to Saturday, May 14th at 8AM Pacific Time. All-access sale opens May 16th at 9AM Pacific Time. You can see the some photos by reading on. MattyCollector has revealed a new in-package photo of their upcoming Masters of the Universe Classics Scorpia. The figure, along with the promise of much more, will be on display at New York Toy Fair 2014. Stay tuned to Toyark.com as we will be sharing photos live from the show , and will be sure to share all the MOTU pics you can handle. Matty Collector has updated with official product images of the reveals from Powercon 2013. Check out clear shots of Battle Lion, Blade and Scorpia, plus details on each after the break! Yesterday was the final day of Powercon, and we have some better shots of the Masters of the Universe Classics reveals from Mattel. They showed off Blade, Scorpia, and Battle Lion. They also had Castle Grayskull packaging on display. There was nothing new there for Turtles compared to Saturday, so we’ve just added additional shots of the new villains and Classics. Check out all the pics after the break! 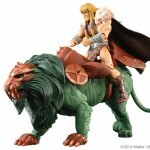 Powercon 2013 – New MOTUC Figures Revealed! Powercon 2013 is on it’s last day, but Mattel had some reveals up their sleeve after all! They’ve announced and displayed Blade, Battle Lion, and Scorpia. Key points from the panel were that they were trying to get Battle Lion’s armor to also work with Battle Cat. We have some quick iPhone pics now, and will be uploading full res pictures with more details later on. Check them out after the break!